Destroyit 2445 SMC is a super micro cut high security paper shredder for shredding highly confidential documents. Dimension: 11 3/4" x 15 1/2" x 28 3/4"
Destroyit 2445 SMC High Security Paper Shredder is a compact desk side high security shredder used by government agencies for shredding sensitive information. Destroyit 2445 SMC paper shredder can shred 5-7 sheets at a speed of 14 fpm. It includes the comprehensive SPS safety package which consists of an electronically controlled, transparent safety shield in the feed opening, an "Easy Switch" control element that uses color codes and back-lit symbols to indicate operational status. The 2445 SMC paper shredder delivers uninterrupted shredding jobs. It prevents paper jams by automatically reversing and cutting off power when shredder is overfed. The paper shredder supports automatic features; it also shuts off automatically when the shred bag is full or when the cabinet door is opened. The automatic start and stop feature of Destroyit 2445 SMC paper shredder is controlled by a photo cell. The Destroyit 2445 SMC is built with high quality hardened steel cutting shafts that are soft metal resistant and can shred paper effortlessly. The paper shredder is quiet and powerful and comes with a single phase motor that is rated for durable gears enclosed in dust-proof housing. The shredder bags are environmentally friendly and reusable. For mobility, the Destroyit 2445 SMC high security paper shredder is mounted on casters. 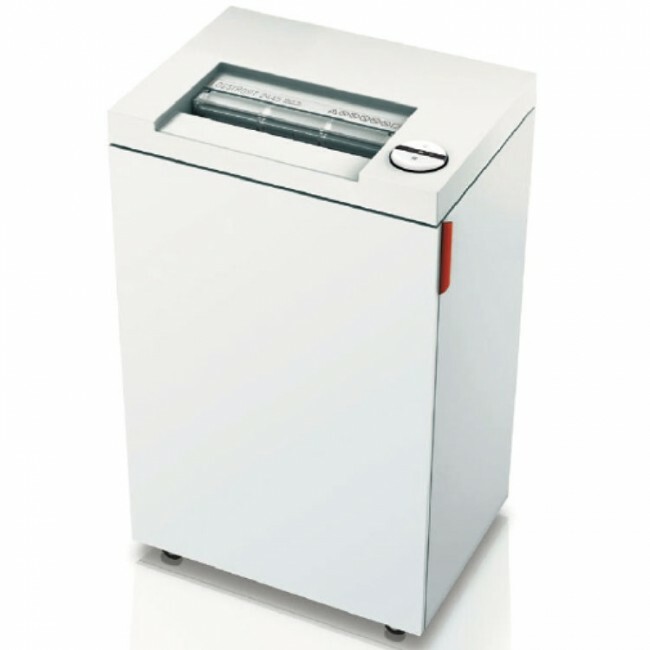 This paper shredder is perfect for highly-classified document shredding.